Like most first time tourists in Barcelona we put some time into reading online recommendations of sights to see, blog posts and, of course, our hero Rick Steves, who blitzes into an area, does a kamikaze run and finds amazing places and highpoints to mention to the masses and then moves on to his next big find. Surprisingly, our destination, Sant Pau Recinte Modernista wasn’t mentioned in the guidebook we had and received scant, if any, attention in our other sources. In fact, we found this UNESCO World Heritage Site by accident when we spread our tourist map on the table and started googling the sights. On our map the Sant Pau Site takes up something like nine square Barcelona-size blocks, a vast amount of space and stands out on that fact alone. Located just a fifteen minute walk from the iconic La Sagrada Familia it’s overshadowed by Barcelona’s multitude of tourist offerings but, the more we read about this place, the more intrigued we became. And hey, we liked the fact that we didn’t have to stand in a long line and the cost was 8 Euros, a bargain by any standard. We approached the gate to this amazing complex along a side wall and were allowed tantalizing glimpses of the buildings within through several ten foot high iron gates. The original location of The Hospital de la Santa Creu (the Hospital of the Holy Cross) dates from 1401 when the Council of One Hundred, the forerunner of the municipal council, and the Cathedral Chapter agreed to merge the six existing hospitals in the city of Barcelona. Located in the center of the city, it served the city’s residents for several centuries. However, by the late nineteenth century, due to the rapid growth of Barcelona’s population and advances in medicine, the hospital became outdated and was unable to provide for its citizens’ needs; it was decided to construct a new facility. 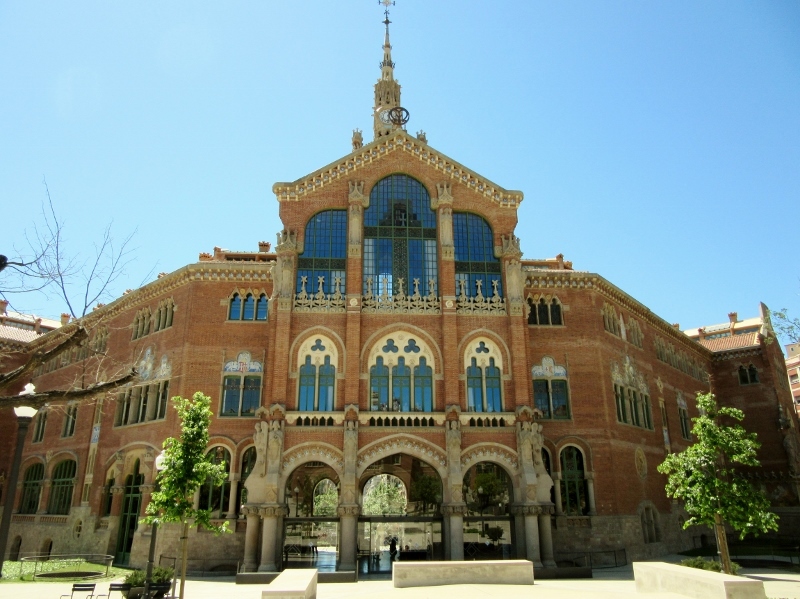 Enter Pau Gil, a Catalan banker who left a philanthropic bequest for a new hospital which would bring together the latest innovations in technology, architecture and medicine and whose name would grace the completed complex, the Hospital de la Santa Creu i Sant Pau. 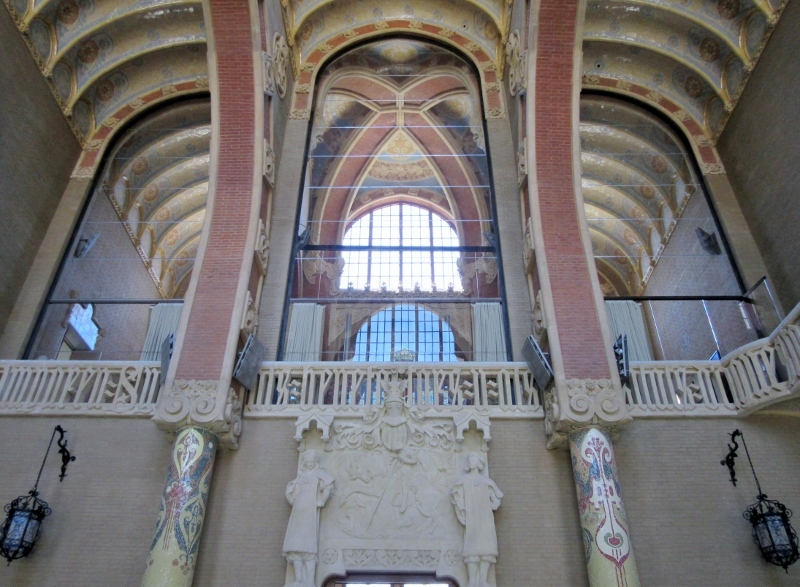 An architect of European renown, one of the outstanding figures of Catalan Modernisme, was commissioned to design the new facility. And here’s where architecture and art merge. Lluís Domènech i Montaner put an ingenious twist on the traditional concept of memorializing the medieval hospital’s history, religious and cultural values. He envisioned an area in the form of a cross (obvious symbolism here) as a “city within a city” sitting 45 degrees off from the urban grid where each building was assigned a different medical specialty. And what buildings they were! Unlike any previous hospital these edifices lifted the very spirits of all who entered by combining natural lighting and ventilation with huge splashes of color from stained glass windows, mosaics, paintings, tiled roofs, turrets and arches contrasted against the dignified elegance of red brick and sculptures of disparate figures of angels and gargoyles, flowers and dragons. The gardens were a unique inspiration by Domènech as they were designed to be used by the patients and their families as a cheerful and optimistic setting during the recuperative process. The grounds brought open space, nature’s beauty and life into a total holistic approach to health and well-being. Domènech began building his Art Nouveau masterwork in 1902 using only materials of the finest quality for its construction and hiring only the most skilled craftsmen who were artists in their own right. Sadly he did not live to see its completion and upon his death in 1923 his son, Pere Domènech i Roura, took charge of his father’s magnum opus. When the hospital was formally opened in 1930 there were a total of twenty-seven buildings, sixteen pavilions of which were built in the modernista style. 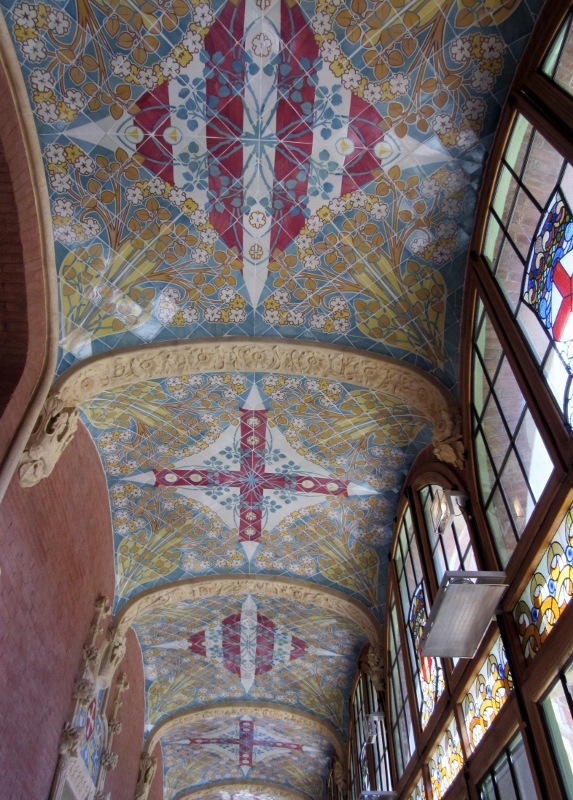 Recognized as a World Heritage Site by UNESCO in 1997, the Hospital de la Santa Creu i Sant Pau served Barcelona’s residents for eighty years until the structural wear and tear on the buildings made it increasingly difficult for the old hospital to meet the demands placed on it and maintain the quality of care. 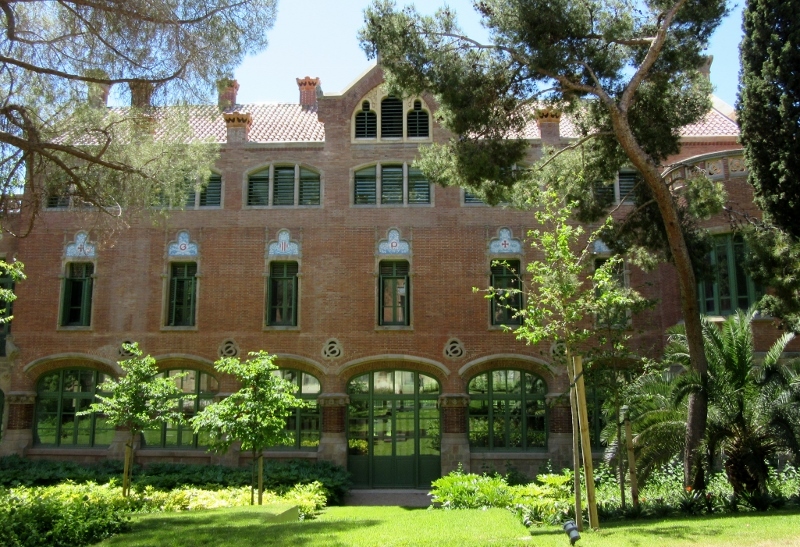 In the autumn of 2009, Sant Pau’s healthcare activities were transferred to a new and state-of-the-art modern building located in the northern section of the grounds which was better suited to the needs of present-day medical practices. And while Lluis Domènech i Montaner’s superb buildings seemed to have reached the end of their working life as a hospital, the modernist complex evolved in a new direction and undertook a new mission. Six of the remaining twelve pavilions have been thoroughly restored by craftsmen with an appreciation for the history and artistry of the original structures and two more are currently undergoing major refurbishments. 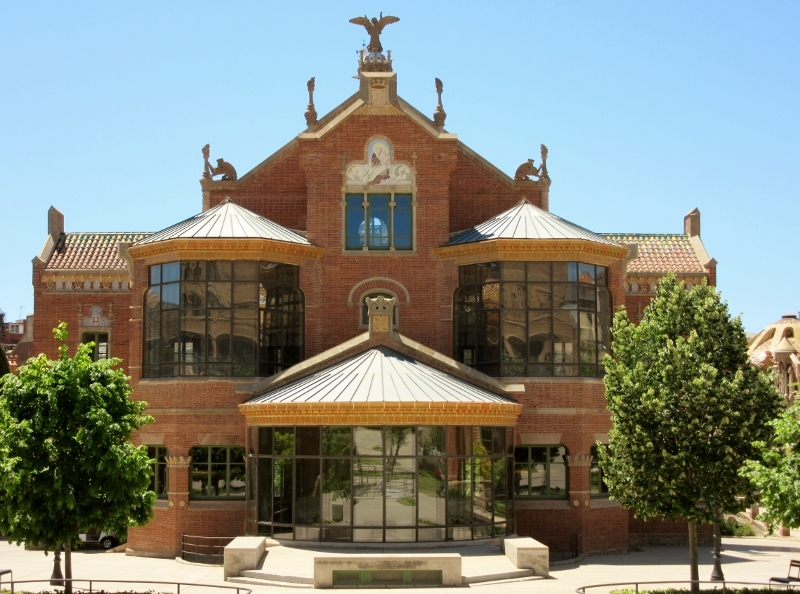 After four years of intensive restoration the Art nouveau Site officially opened in February 2014 and has reaffirmed the value of Domènech’s work as well as established Sant Pau as a major center for knowledge and a cultural landmark. Guided tours are offered in several languages throughout the week as well as audio self-guided tours. The complex serves as a fashionable venue for corporate and private meetings and evening musical concerts, ranging from classical to jazz to African and Latin-American music. 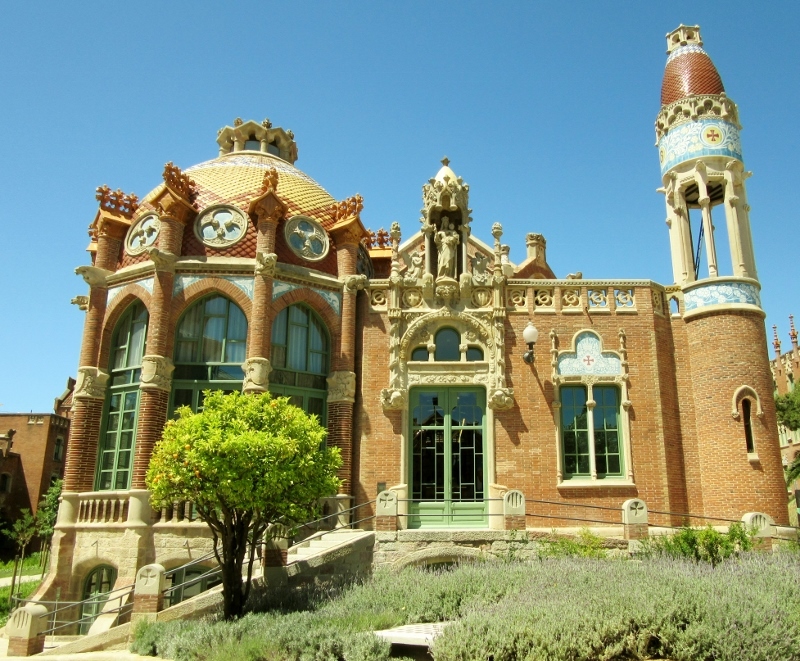 The Sant Pau Art Nouveau Site has assumed its new role with the same grace, style and dignity for which it was renowned for when it was a functioning hospital in its prior incarnation. As we walked around the magnificent Administration Pavilion and gaped at the light streaming through the stained glass windows and colors on display in the mosaics we couldn’t help but be glad that we’d selected this site as one of our first places to see in Barcelona. It may be off-the- beaten path for now but it’s a place that’s going to become more and more popular and populated as people discover it. And then the serene gardens through which we strolled, contemplating the beauty and genius surrounding us, won’t feel quite as peaceful. It’s fills my heart with joy to know that the both of you are enjoying life the way it was supposed to be lived. We are still here in Corpus Christi working hard to save enough cash to do what you are doing now. lately. Lots of rain here this month. Stay safe and have fun. So terrific to hear from you all and know that you’re a little bit closer to the retirement dream yourself. Retiring early and choosing to become longterm travelers is the best thing we’ve ever done and, just because we’re not working, doesn’t mean we’re not learning as you can see. Each new city and country presents challenges but the experience is amazing! Beautiful photos and amazing architecture. Barcelona is one of my favorite cities. I don’t always take enough time to research and often travel “on the fly” and figure it out as I go. However there is something to be said for planning! Thanks, Suzanne. Barcelona has become one of our favorite cities too! Part of the fun of traveling for us is the anticipation factor and we always read and research the places we travel to for ideas, tips and recommendations. However, when we know we’re going to be there awhile we approach it more like you, “on the fly” so that we have some spontaneity and can let the sight-seeing evolve. It’s fun both ways! We spent a month traveling in Spain and Portugal but didn’t make it north to Barcelona. When we visit, this site will be on our “must visit” list. Thanks for the tip! We loved this UNESCO WHS – definitely not a hard place to recommend! We spent all of our time in Spain focused on Barcelona so we’ll have to follow your footsteps next time and explore more of the country. There’s so much to see, learn, explore and do in this area that the “must visit” list gets longer rather than shorter! What a stunning find. The art nouveau buildings are outstanding. Imagine how quickly one could recuperate in such a beautiful environment. But Sant Pau probably won’t be so tranquil when the word gets out – you are very fortunate to have had this experience now. Thanks for sharing the beautiful photos and interesting information, as always. If one has to be ill this might very well be a place to recuperate, especially in the shaded gardens! The orange trees were gorgeous and the flowers were so colorful. A perfect place to sit and enjoy the domes, turrets, arches and color of all the buildings. How lucky you were to get to see this magnificent building. 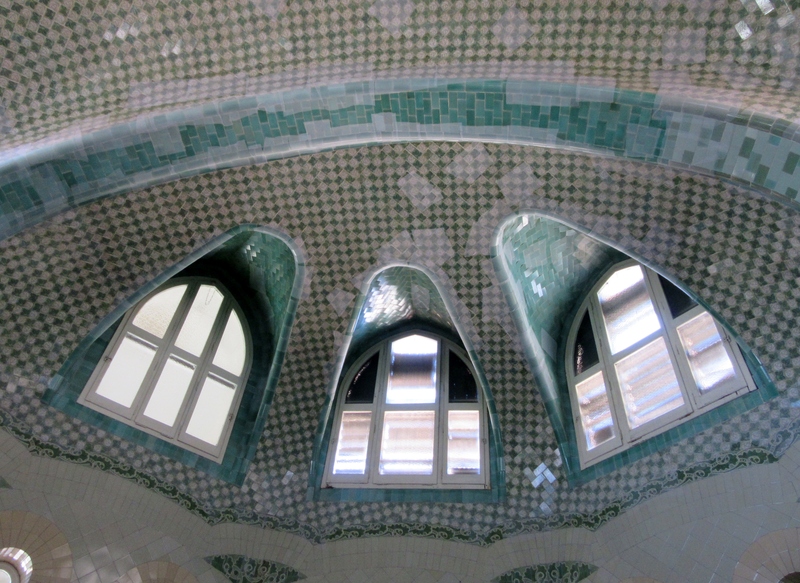 The last time we were in Barcelona, it was under renovation and we could just fantasize about the interior. So happy to have read this post and can’t wait to visit it on our next trip. It looks like our timing was perfect! We had a chance to wander around the grounds of this UNESCO WHS without the lines and crowds of people and were able to enjoy examining the beautiful interior and craftsmanship details of the Administration Pavilion as well. Definitely worth putting this treasure high on your places to visit list, Irene! i’mba repeat visitor to Barcelona and had never heard of this complex… It’s true that I donmt do a huge amount of research but still… What a discovery!! Now I’ll have to return and see this – just my kind of architecture. One of the things we love best about travel is the chance to dig into the history and culture of the place we’re visiting. Still, it really was just by chance that we happened upon the Sant Pau Art Nouveau Site and it really did feel like a place we ‘discovered.” Truly magical! The best part of traveling to a new city are the things we are lucky enough to “discover” for ourselves! Well-written post about a hidden gem which displays the architecture Barcelona is famous for, gives a glimpse of the caring the place provided for the people, and the thoughts of a couple bent on giving their readers a good feel of another discovery! Thanks, Carol for your kind words! The Sant Pau Art Nouveau Site really did have a feeling of “discovery” and we were surprised that there wasn’t much written in the guide books or brochures about it. Great for us but it won’t be long before it becomes filled with many people who want to discover and appreciate its beauty and magic. As you know, when we recently stayed in Barcelona, our Airbnb was right around the corner from this beautiful place. We never got the chance to go inside, so it was lovely to come along with you to see the exceptional art nouveau embellishments at Sant Pau. So glad we could meet up in Barcelona, too! It really was great to meet you and Pete, too and I’m hoping that our paths will cross again in some exotic place. 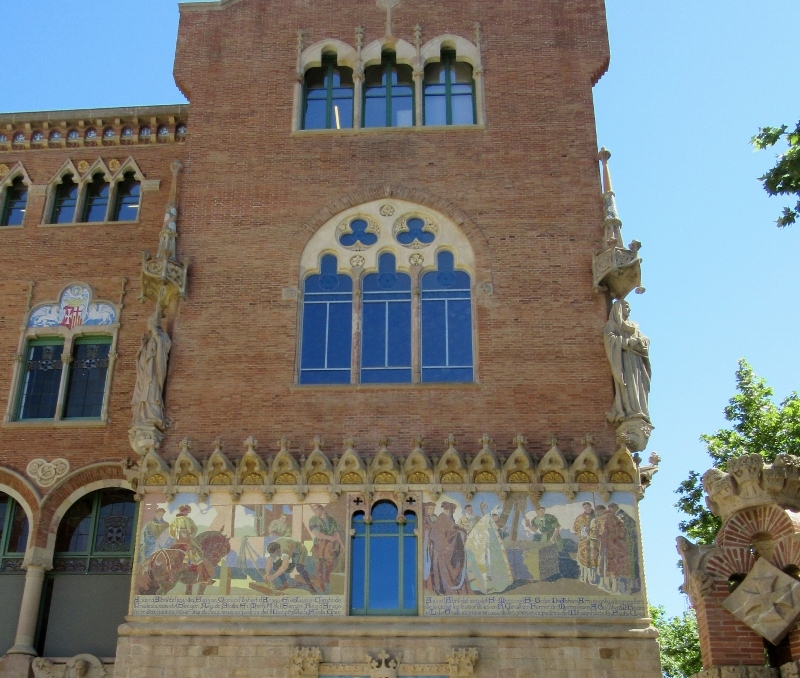 We definitely would have made a return visit to the Sant Pau Art Nouveau Site if we’d stayed in your location as there are so many art objects it would be fun to examine more closely. One of the best things about travel blogs (besides getting to meet the writers!) is that we can each share different experiences. I guess that timing is everything! We loved the fact that there were very few people in this amazing area and that we could take our time wandering around between the buildings and sitting quietly on the benches scattered about. The gardens are beautiful and tranquil and provide a fabulous backdrop to appreciate the awesome buildings. I have heard of Hospital de la Santa Creu i Sant Pau and meant to see it on my last trip to Barcelona, alas I brought a nasty cold with me from Austin and spent the first 2 days trying to rest up, staying close to my place in Gracia, and I did a hop-on hop-off bus tour around the city. 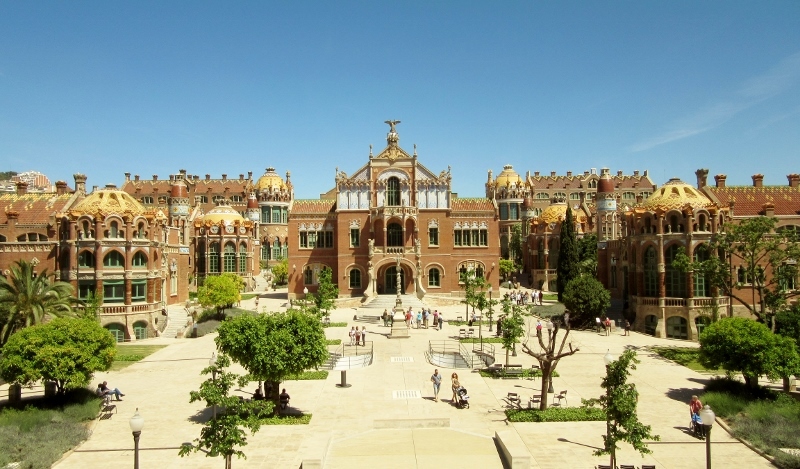 Every time I read about Hospital de la Santa Creu i Sant Pau I have a big desire to get back to Barcelona – there is so much to do & see, I love Barcelona! Thanks for the beautiful virtual tour! It’s so frustrating to be ill when all you want to do is see the sights! The “problem” with the magnificent city of Barcelona is that there are so many amazing things to see, do, learn, taste and experience there’s always going to be a reason to make a return visit! I’m guessing this site wasn’t showing up before you went because it’d been under renovation and wasn’t a place to visit during that time. I know because my sister and I were there in June of 2013 and didn’t realize that and ended up doing a very poor hardhat tour in mud! Perhaps we’ll get back to see it one of these days now that it’s beauty has been restored! A visit now would be well worth your time, Kay. The grounds were spectacular with the flowers in bloom and orange trees heavy with fruit – no hard hats or mud puddles in sight! This site may have fallen off the radar while it was being restored. My sister and I went there in 2013 and didn’t realize it was construction. We ended up having a very unrewarding hardhat tour in the mud! It looks as if they did a lovely job with the restoration – may we’ll get to see it next time! Evidently your tour was one of the limited tours after the hospital closed in 2009 during the four years while the first six buildings and grounds were being renovated. It might have been difficult to appreciate the craftsmanship and architecture during the refurbishment process and while navigating through the mud! Thanks Ed. So glad you enjoyed this post and the pics. We had a great time exploring this amazing place and it was fun to share it too! I’ve been to Barcelona several times and never even heard of this! It looks like it would be particularly special for a party, wedding or festival! One of the beauties of slow travel is that we have the time to check out off-the beaten-path areas and only noticed the hospital because it covered several city blocks on our map. 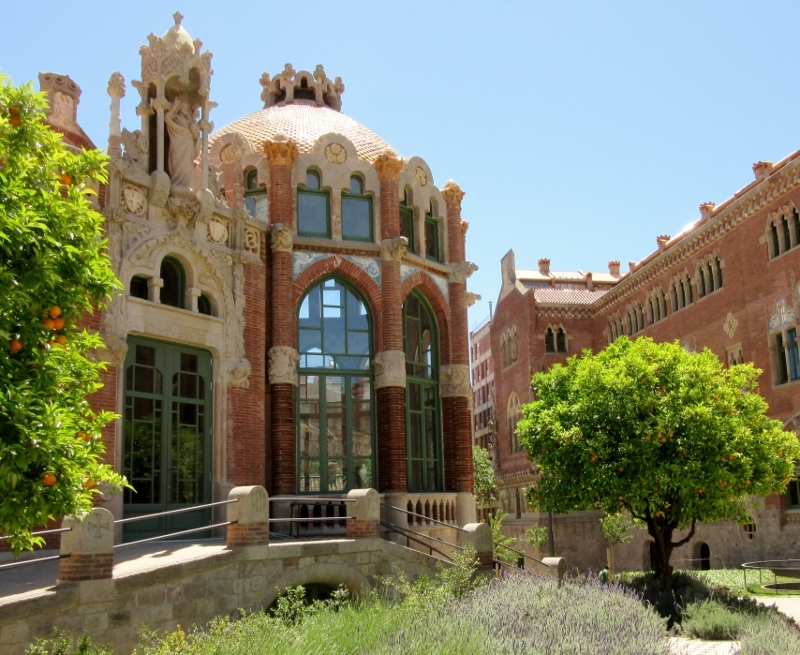 The recent reopening of the Sant Pau Art Nouveau Site in late 2014 may explain why tours and brochures have largely bypassed this incredible site. But not for long … ! What amazing buildings! I can’t get over the fact that it was originally a hospital. 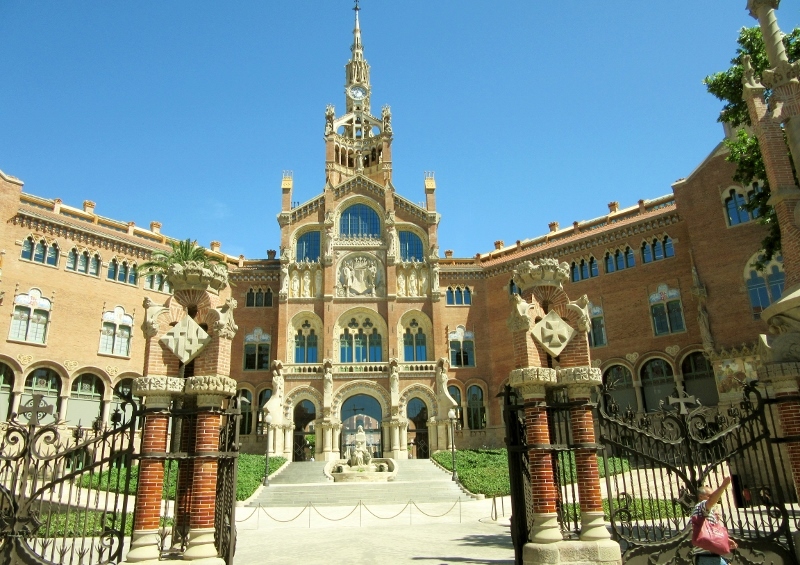 I’ll certainly be adding the Sant Pau Art Nouveau Site to my list of places to visit when I go back to Barcelona! One of the staff members we talked to described being a patient in the hospital when she was younger. There are several underground tunnels where supplies could be shuttled between pavilions and the hospital had a very prestigious reputation. An interesting point is that Domènech appears to be one of the first architects who embraced the concept that environment plays a role in the recovery from illness and disease and also designed areas to include visits from family members. Like you say, this won’t be off the tourist path for long. It really is stunning. I would love to go to a concert there. I imagine that, with the initial refurbishment finished and the rest ongoing, word will get out, the reviews will come in and Sant Pau will be rediscovered as the treasure it is. However, it really was nice to stumble upon it and enjoy a quiet and beautiful place, almost to ourselves. I also like the idea of a concert on these grounds – it would be amazing!. This is gorgeous Anita. Glad you were finally able to get out and about in beautiful Barcelona. We missed a lot while we were lying about with our colds. We’re so glad you enjoyed this post, Ann and I hope you saw a few things during your initial brief visit. It sounds like you might want to make a return trip to Barcelona as well. Lots of people enjoy solo travel and seeing exactly the places they want to visit but I’ll bet finding an agreeable travel companion might not be too difficult and may be even more fun! Wow, Sant Pau Recinte Modernista is great. I hadn’t known about when I visited Barcelona, but, as you mention, there is so much to see in Barcelona. I will put this on my list for any future visit to Barcelona. By the way, I used Rick Steeve’s walking guide to explore much of the Gothic area and the Eixample. We’d thought about trying out Rick Steeve’s walking tours for both the Gothic Quarter and La Ramblas but ended up in each place without much planning. You’re right about there being so much to see and it was very easy to roam and wander and enjoy the random places we’d end up in. Such an amazing city and worth several return visits! Even the beauty of the gardens is magnificent. I’m so glad for all the gorgeous windows, and even more glad I’m not the one cleaning them! Ha-Ha Susan – Cleaning windows here would be a never ending job! It’s very evident that a lot of patient love and meticulous care have gone into renovating and caring for these gorgeous buildings and grounds. How lucky we are to pay a few Euros for the privilege of enjoying all of the amazing beauty. Thanks so much for your kind words, Jim – we are truly flattered. At one time we thought if would be fun to submit some articles to travel magazines or try to get comped into some luxury resorts but there’s a lot of very talented competition out there. Right now it’s a fun hobby but, to be truthful, we’re not sure if we want to work that hard! Maybe someday … For now it’s a terrific way to stay in touch with family and friends as well as meet new people online. Wow!! What an amazing find. Looks like several days could be spent finding all the hidden beauty of Sant Pau. Great post, as always, full of good information. Thanks Suzi. It would be fun to go back (several times!) and look at each detail. As it is, everything works together so beautifully but there are hundreds of pieces of art that combine together to make the the whole site so awesome. You’ve been to many places we’re still dreaming about seeing, Ann. It’s still amazing to us to be able to “live our dream” of travel and you’re fortunate to have been able to travel to so many places as well as savor the memories. Sounds like you have plenty of things demanding your attention now but I know that you’re enjoying your creative writing as well as sharing it with many other appreciative readers!